Aside from one brother, I am now the last of my family left who can talk about the family. I was born in Watford in 1927. Our family was a boxing family of Watford. We were four brothers, known as the Buxton brothers. In the 1940’s and 1950’s, our family were featured in the Watford Observer nearly every week. My family were the best known family in Watford. My mother came from Bushey. My father came from Antigua in the West Indies. There were four boxing brothers. I was the youngest. In those days, we didn’t have a lot of explaining to do. Boxing was very popular, and Watford Town Hall hosted many boxing events. 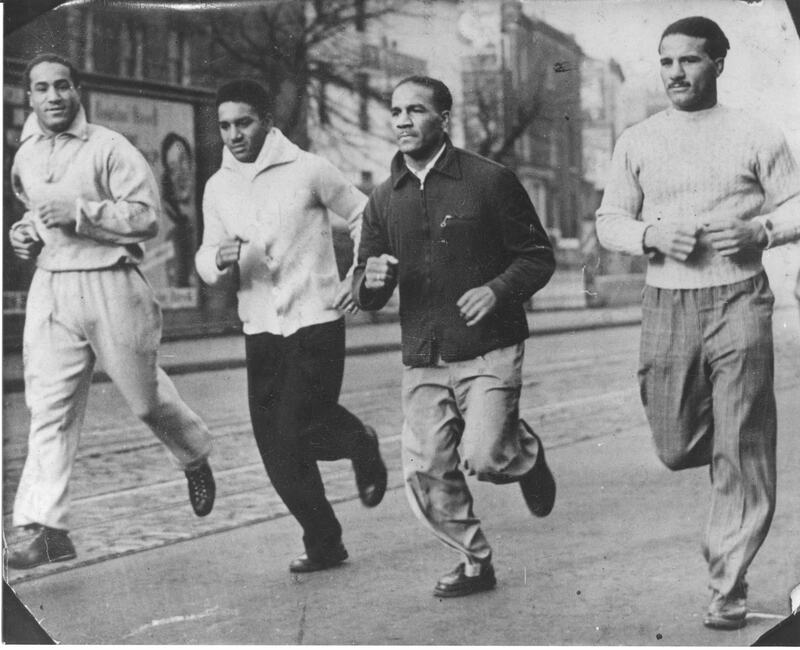 All four or us Buxton brothers fought in Watford Town Hall on the same night and bill, and we all won. From 1946 to 1954 you will find a lot in the newspaper about our family. My brother Alex was British Light Heavyweight champion. He brought the first professional title back to Watford. 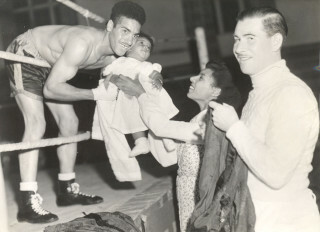 He lost the title to Randolph Turpin – they were a boxing family similar to us, but there was only three of them. 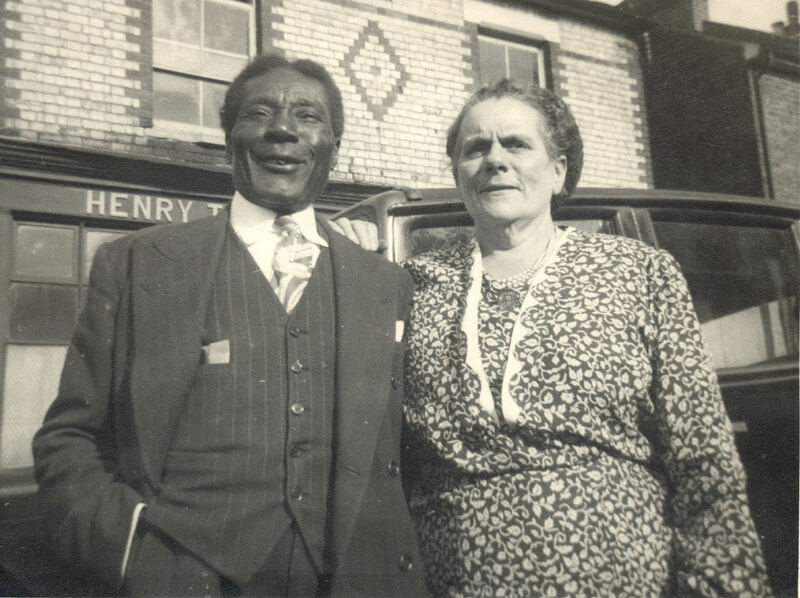 When dad came to Watford, they had never seen a black man before. During his life he became so popular. He was a good man. Everybody loved him. We grew up the only dark skinned family in Watford. But my father paved the way, and we never experienced any prejudice, not like there is today. We were part of Watford and I’m very disappointed about the way life has gone because, when I read in the papers about coloured people complaining about prejudice, I have never experienced it. There’s not all that of the old Watford left nowadays. Most of the people I grew up with have either moved away or died. 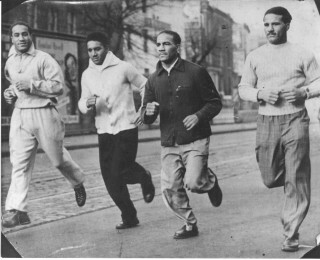 My Uncle Charlie as mentioned earlier helped train the Buxton boys. The Buxton boys were held in such high regard by my family that ,I was named Allan after Allan Buxton. My cousin Laurie, Charlie’s son was named after Laurie Buxton. My family migrated to Australia in 1960. Hi I recently bought a signed photo of a person boxing No gloves on, which is signed Mike , and cannot work out the last name. I looked at the poster on the photo and saw the name Alan Buxton on the poster in the background, also another Buxton name below . I then looked up the name and found this site about Alex. He sounded a fantastic person, and up until today I had never heard about him or his brothers. I’m 58 and did a bit of boxing whilst at school. Hi all I am a local born and bred watford boy, I am also a boxer and accidently stumbled on some watford boxing history, does anyone know where buxton used to box, like what road? Is his brother still alive or anyone who knew him well? I’d love to find out more, he is so inspiring as a watford man and fighter, I hope I can emulate him! Hi Allen, Do you remember my dad, Ron La Castra? John Dobson, I remember the ring cafe being opened in Garston by Randolph Turpin he opened it for the Buxton family. Laurie taught me to box when he lived in Watford I often watched Allan box. Would love to hear of any news on the Buxton family. I read about the Buxton brothers; very fine fighters. Laurie’s daughter Lacey used to look after me, she had a massive book and I would always read it. Lacey always told me stories about her dad and uncles. Hi Just looking through some old photos of my late mum. Betty Allen (nee Kempster) and found two signed photos of Alex. Thank you for the wonderful comments about the Buxtons which I do forward on to the family. I’m afraid Alex passed away last year leaving Allan as the only surviving brother. 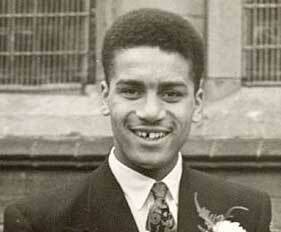 does anyone know if alex buxton is still alive, he is a legend in boxing and proper old school. they dont make the likes of him anymore. Hi, I too remember the Buxton family. I was born in 53a, Sotheron Road, Watford, and used to play with Allan in his back garden. His parents used to have a little sweet shop they ran from the front room of their house. After leaving Watford to live in Islington in 1934, my mother used to take my brother and me back occasionally to visit the Buxtons and other friends of hers. Allan, Do you remember the ice cream factory just across the road? i grew up in the same road as the Buxton Family. They were fine people. I remember doing my paper round on a dark morning when I saw Alex out on an early morning run,now when ever I see a Rocky film I remember Alex. I went to school with one his nephews and a good mate. i am laura i am the grandaughter of alex buxton my dad is his son alex i have memories of meeting my grandad when i was a young girl i am just showing my daughter olivia her family and where she comes from. Alex Buxton lived in Sydenham….We came home by bus with Alex’s purse after his 1952 fight with Randy Turpin…He had two white Bank of England envelopes and I had two more, which were his purse for the fight….Alex was a great friend for over forty years, although I have lived away from England…He was unlucky to be a champion in the same era as Randy Turpin…But he will always be in boxing history as the British Light Heavyweight champion…….His two twelve round points losses to Dave Sands in Australia were two of his best fights. A friend who was a US Marine in Australia told me all the US Marines would go to his fights “to cheer for the Marine”….We played golf often and I took a photograph of Alex and I taken in the early fifties…..Just a super human being….. I knew this family from a very early age and a friend of mine (juanita Barnes) is a relation and is very proud to be one.